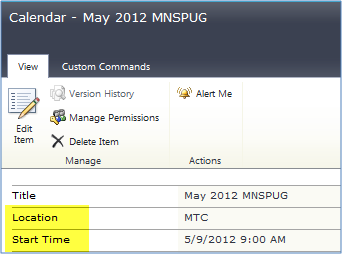 Last week I have a blog post on the CQWP Add and configure in SharePoint 2010. 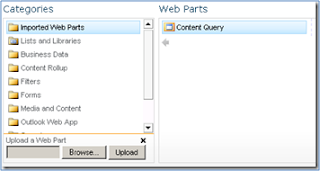 In this post I will provide you some basic idea about customizing the Item Style templates for the CQWP (Content Query Webpart). Microsoft SharePoint Server 2010 includes three Extensible Style Language (XSL) files that you can modify to render fields in styles that the Content By Query Web Part uses to display the content it aggregates. This topic identifies the three XSL files the Content By Query Web Part uses and describes how they work; identifies the templates and variables that you can modify; and describes how to modify the files so that the Content By Query Web Part renders data with the look and feel that you specify. The following table lists and describes the three XSL files that describe the Content By Query Web Part. 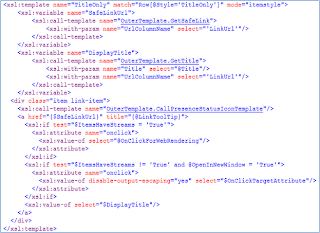 Contains logic that generates the appropriate calls to the Header and Item templates for each item. Contains functions that help designers modify the Item and Header XSLT transforms. Receives all the content, parses it, and sends appropriate pieces to the ItemStyle and Header templates. Maintains the structure of the Content By Query Web Part. Stores data retrieved when querying content in the path /dsQueryResponse/Rows/Row. ItemStyle.xsl \Style Library\XSL Style Sheets\ItemStyle.xsl Contains templates that define how to display an item. These templates receive and process one row of data at a time, ensuring that the style and data in the item rows is consistent. You can retrieve data about a row by using the @Property directive. Header.xsl \Style Library\XSL Style Sheets\Header.xsl Contains templates that define how to display a header and ensure the consistency of group headers. Templates specified in Header.xsl receive the next item row to process, usually the first row in a group unless there are multiple columns. If there are multiple columns, the templates receive the first row of the column. You can retrieve data about the next item row by using the @Property directive. You can use the $Groupparameter that contains the groupby column name and the $GroupType that represents the column type of thegroupby column. 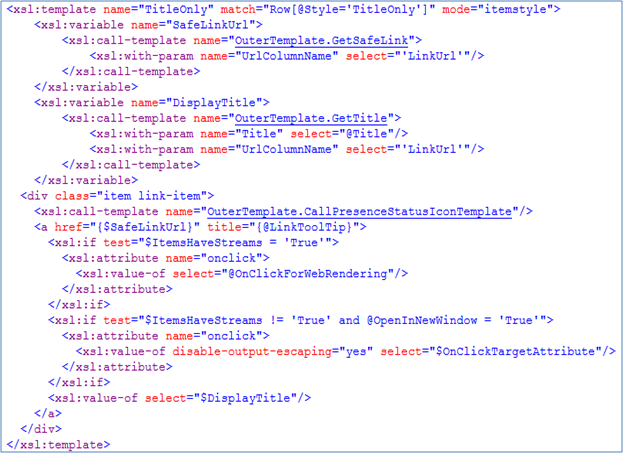 Now we need to customize the ItemStyle.xsl to include additional properties. Open your root site in SharePoint Designer 2010. 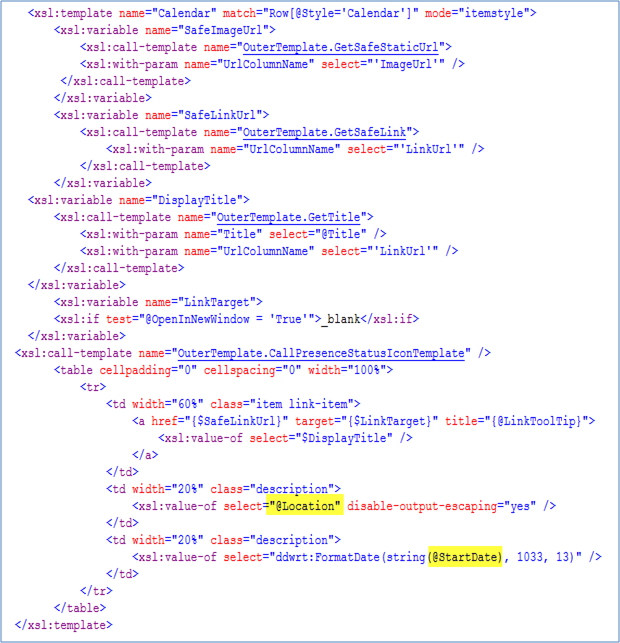 In the Navigation pane, go to All Files > XSL Style Sheets > ItemStyle.xsl. Right-click on ItemStyle.xsl and choose Edit File in Advanced Mode. Click yes at the prompt. Make a backup of ItemStyle.xsl BEFORE you modify. Since I'll likely want to modify the Calendar date field format, I've added the ddwrt namespace to the top of the stylesheet. 1.To do so, copy the template style that most closely matches the style you're looking for e.g. "TitleOnly". 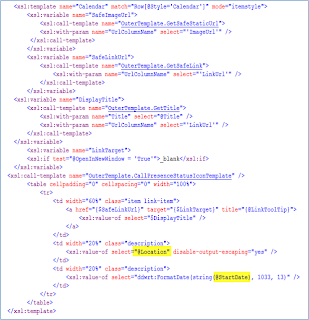 2.Paste this just above the "Hidden Slots" template (You can paste is anywhere in xsl). 3.Rename "TitleOnly" in both the template name and match="Row…" to a custom template name. In my case, I chose "Calendar". 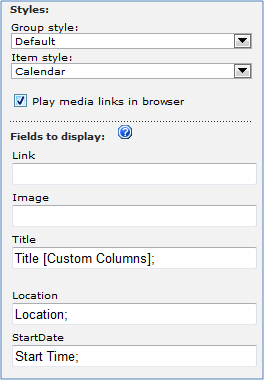 4.Once again, this template name corresponds to the Item Style dropdown in the Web Part editor. In order for this style to show up in the options available to the CQWP, save and check in the ItemStyle. (I usually check in minor versions until I have completely finished creating the style template). Go back to the page where you added the CQWP and make sure you're in Edit Page mode. From the Web part menu, choose Edit Web Part. Under Presentation > Styles, click the drop-down and select the new style you have created. Click Apply. You should now see empty slots for Location and StartDate. In the screen shots below, I verify the columns names: Location and Start Time from View Calendar Item (but you could find these other ways) and then add the SharePoint column names to the CQWP. 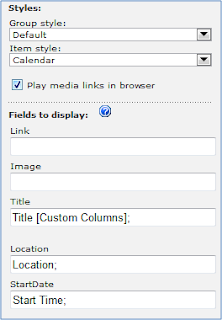 Notice how the Title slot needs Title [Custom Columns]; I still haven't quite figured out why that is, but I've run into the same situation with a few other fields so I just let SharePoint be SharePoint and continue on my merry way. Once you completed these steps, click Apply and/or OK to save your web part modifications. If you get a message "Unable to display this Web Part…." along with Correlation ID when you save the web part, something is wrong with the XSL that you've created. You will need to tweak it or remove it altogether and start over. 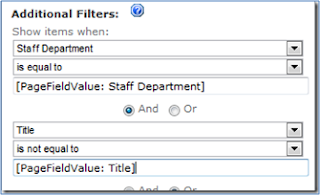 BUT – there is a way you can include MORE filter criteria – and you don't have to change the other settings within the CQWP you've got in place – often important with regard to style/layout/etc. This can be used to add MORE filters (where clause) and will be used instead of the 1,2,3 filters. You just need to define the CAML to put inside the property – and then save the WEBPART. So – we can use that XML (CAML) within the CQWP webpart – by replacing the "QueryOverride" tag. Next step is to copy that piece of XML into the .WEBPART file – and save it. ** Note: Remember to include the CDATA tags – and also – ditch the original "QueryOverride" tag. Also – remember that the 1,2,3 filter values are now IGNORED – so you'll have to do it ALL in the CAML query. THEN – have to re-click the "Add WebPart" button and then you'll see it listed in the "Imported Web Parts"
And – that's it – hopefully, it should be working OK.
PageFieldValue token will filter the items based on a current page's field value. The query above will fetch me all the items whose Staff Department is Photography (in this example) and adding Titlenot equal to current page's Title vale will eliminate the current item appearing in the results. 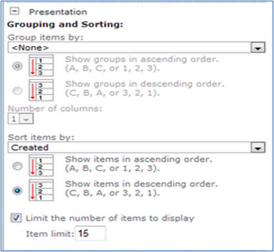 In the Presentation tab you can Group and Sort items by the column name and also assign the sort order as Ascending or Descending. You can also limit the number of items to display for content query web p​art.